Navy officials have begun notifying 120 active-duty, full-time support and drilling reserve E-7 through E-9 sailors that they must retire by the end August. The decision to send these sailors home sprang from the 2019 Senior Enlisted Continuation Board that began meeting on Dec. 3 in Millington, Tennessee. 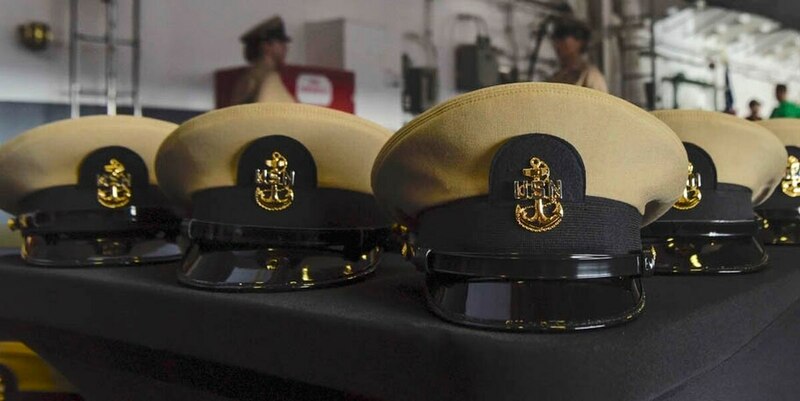 The panel scrutinized 7,984 retirement-eligible senior enlisted sailors, looking for patterns of misconduct or declining and substandard performance, according to the Navy. The board drew up a list of 120 senior enlisted sailors — 102 active, 3 reserve full-time support and 15 drilling reserve sailors — who won’t be allowed to continue serving this year. Comprising about 1.5 percent of the sailors the board reviewed, it was the lowest number of sailors forced into retirement by the board over the past nine years. Smith (SW/IW/AW) said that it’s important that junior sailors see those leading them held to high standards and that there are consequences for senior enlisted personnel who don’t make the grade. Navy officials have announced the details of this year's senior enlisted continuation board. Those who were not selected to remain on duty must retire by the end of August unless they’re granted operational waivers based on the needs of the Navy. Those granted waivers must retire by the end of November. Last year, the board marked 160 active, 12 reserve full-time support and 16 drilling reserve sailors for mandatory retirement — 2.5 percent of the 8,251 sailors the panel reviewed. Every retirement eligible senior enlisted sailor got a look from this year’s board, except those who were advanced during the previous three years or those who already put in their retirement papers. There are no exceptions, including the MCPON. Panels will begin in September and you might be on a list. The board was created by then-MCPON Rick West (SS/SW) and held its first session in 2010. It forced 158 senior enlisted sailors to retire, the lowest cull in the panel’s history until now. When West dreamed up the board, the Navy was in the final stages of a drawdown. Some senior leaders wanted to give the board a mandatory number of sailors to force into retirement, but West fought that notion. The board has convened during seven of the last nine fiscal years. Over that span, the panel forced 2.069 senior enlisted sailors to retire, about 3 percent of the 60,783 personnel who were reviewed. A board to look at senior officers was created last year and it’s modeled on the senior enlisted panel.